DURHAM, N.C.–TransLoc, a technology provider of flexible, city-owned microtransit solutions, today announced the launch of its first-ever MicroTransit Accelerator Challenge, a competition to identify and reward the nation’s most visionary transit agencies and municipalities with the expertise, planning resources, data analysis and predictive insights to stimulate demand-driven, flexible transit in the communities they serve. Three winners will be awarded comprehensive microtransit consultation and data analytics services from the experts at TransLoc. The deadline for applying is October 27, 2017. Microtransit, the flexible, city-owned demand-response mode that bridges the gap between single-user transportation and fixed-route services, has the power to positively impact a city’s social mobility and economic viability. Transit agencies and cities are invited to submit an application (comprised of short answers and essay questions). To learn more and to apply, visit go.transloc.com/microtransit-accelerator. Challenge entries will be judged by a panel of world-class public transportation and smart city experts, including Gabe Klein and Peter Hirshberg. Winners will be announced on November 17, 2017. Increased Ridership – How ridership can be improved by reaching new and underserved areas, expanding access to existing transit service areas, or introducing new communities to existing services. Social and Community Value – How agencies believe they can leverage microtransit to embrace social challenges and support the economic vitality of the communities they serve. Environmental Impact – How agencies envision microtransit supporting efforts to reduce emissions or deploy environmentally-friendly vehicles, promoting green mobility initiatives and reducing vehicle miles travelled. Improved Efficiency – How agencies plan to increase efficiency of current or future transit plans, ridership, route utilization and more using microtransit. 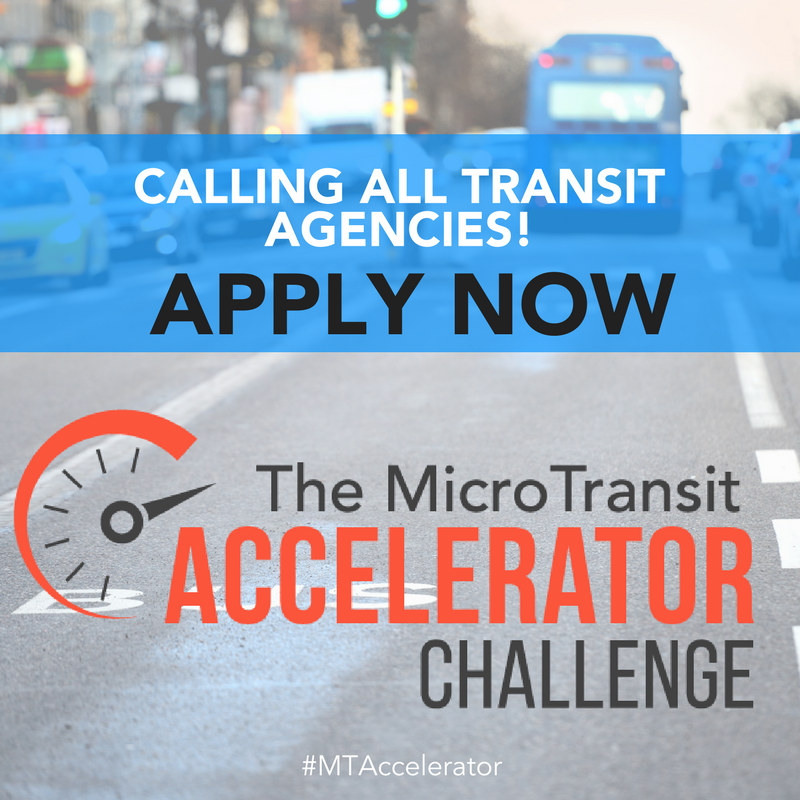 The MicroTransit Accelerator Challenge builds on TransLoc’s commitment to helping cities and transit agencies deliver the ultimate rider experience through the use of big data, simulation, predictive modeling and innovative technology. In sponsoring this contest, TransLoc hopes to gain a deeper understanding of the challenges transit agencies are trying to solve using microtransit as well as inspire municipalities to consider how both fixed and flexible transit can work in concert to usher in a greener, smarter future for their communities. This hands-on working session provides direct consultation with our Microtransit Pre-Planning Services team. Our data scientists will work directly with your team to identify the key metrics that will make your vision a success. If your agency does not currently have data available, TransLoc data scientists will leverage industry benchmarks and other critical data from agencies similar to yours. The TransLoc MicroTransit team will present to your agency our findings based on the computer-generated microtransit simulations created using several key data sources. The team will present multiple scenarios optimized for rider experience and operational efficiencies with recommendations for making your microtransit service a reality. Our data scientists work directly with your team to identify the metrics that are crucial to understand and analyze to make your vision a reality. If actual data is not available, our team will provide industry benchmarks and data from agencies similar to yours. The TransLoc Microtransit team will present our findings based on the computer-generated microtransit simulations created using your agency’s data and several other key data sources. The team will present multiple scenarios optimized for rider experience and operational efficiencies with recommendations for next steps. Hailed by Fast Company as one of the world’s most innovative companies in transportation, TransLoc, a Google partner, is the technology provider of the most flexible agency-owned microtransit solution for delivering the ultimate rider experience. By offering predictive models to simulate rider demand and fleet operations, the expertise to plan and deliver unique future-proof transportation solutions, and its cloud-based OnDemand dispatch system built for rapid deployment and hands-free operations, TransLoc is enabling transit agencies nationwide to remain central to the future of modern transportation. TransLoc has partnered with more than 250 providers to reach a higher level of service and win the confidence of riders for more than a decade. To learn more, visit TransLoc.comor follow us on Twitter at @TransLoc.